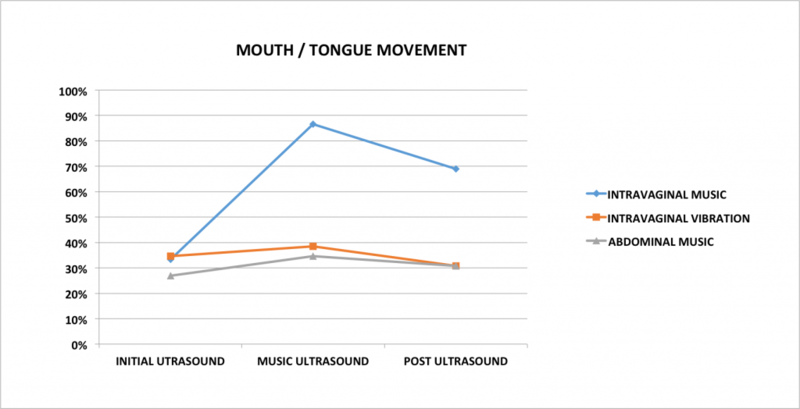 (4) – THE RESULTS OF THE FIRST STUDY – Scans previous to stimulation showed that 45% of the fetuses were moving the head and the extremities, and that 30% were moving the mouth and the tongue. This is normally what they do when they are awake. 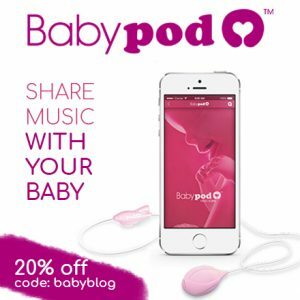 When the vaginal music stimulation (using the Babypod) was turned on nearly 90% of fetuses woke up, they reacted with unspecific head and extremity movements and with specific mouth and tongue movements that decreased significantly when they stopped hearing the music. Around 50% of fetuses reacted with a very remarkable movement, opening the jaw as much as possible and sticking out the tongue to its limit. During the abdominal music stimulation (using earphones) we saw certain degree of fetal activation, but no increase of specific mouth or tongue protrusion movements were observed. The same happened in the vaginal vibration stimulation group. When the 3 different groups of stimulation were compared, only the vaginal music group showed statistically significant differences when waking up the fetus and in specific mouth and tongue movements. We were sure, after seeing these results that if fetuses don’t respond to abdominal music is because they cannot hear it, and that if they do respond to vaginal music is because they can hear it. The fetuses do not respond to vaginal vibrations, i.e. they react to music but not to sound vibrations. This is very important to diagnose deafness. From the start of the research I was in contact with Professor Bernal, professor of Otolaryngology at the Clinic Hospital. He is an excellent professional and he helped me design the study. He was very interested in it because if the fetus responds to music, it means the fetus is not deaf. People who are deaf perceive vibration but not music. We saw that the reaction was happening from week 16 of gestation! Can you imagine a little one (11cm and 100 grams) reacting to the sound of music? It’s incredible! We discovered that the fetus hears and reacts from a much earlier stage than previously thought. The inner ear is formed completely on week 16 of gestation, but the functionality of the auditory system in the medical literature, up to date, was only confirmed from week 26. 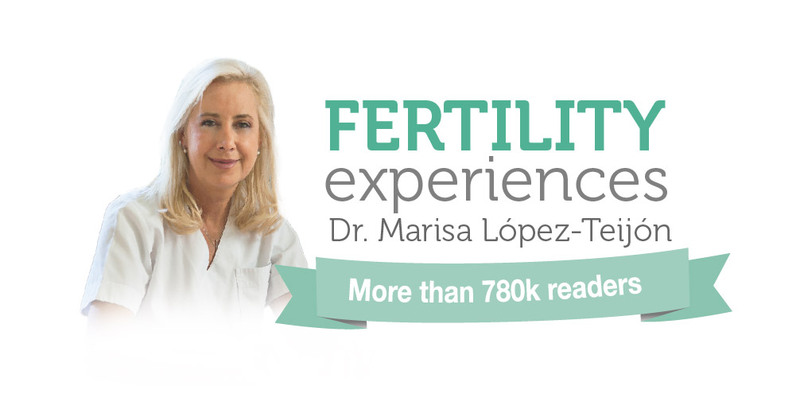 The fetuses show a different reaction in each examination and the time that it takes for them to react varies a lot. The type, number and intensity of movement is different, and so is the length of time that the movement lasts once the stimulation has stopped. But as the gestation progresses, the facial movements increase. We didn’t find differences between boys and girls. From the very start I was very interested to know how twins would respond: they have the same reaction! It’s incredible! Up to this point we had discovered very important facts. But then, what can be heard in the uterus? Why abdominal sound doesn’t reach the fetuses and vaginal sound does? Next Post The Story of a Discovery (5) – What do we think can be heard inside the uterus?